2. Slice off the top quarter of the garlic bulb, lay the bulb in the centre of the parchment paper square, and drizzle over one teaspoon of olive oil, daubing all exposed edges. Draw up the edges for the paper to form a parcel, securing with twine or a metal paper clip. Place on a baking tray or dish and roast for 45 minutes. When roasted, cool slightly and pinch three cloves from the bulb and squeeze from the skin into a small jug. Wrap up the remaining cloves and store for another use. 3. While the garlic is roasting, trim the carrots and slice into quarter lengths. Toss the carrots in the remaining oil and add to the 'garlic tray' for the final 20 minutes. 4. Add a bit of salt to the garlic cloves and beat well with a fork, until creamy. Spoon the tahini into the jug, along with the honey and lemon juice. Gradually whisk in the warm water until it is evenly mixed and light. Set aside. 5. Steam the flower sprouts for five minutes. 6. 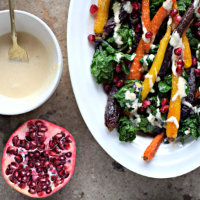 To assemble, lay the carrots and flower sprouts on a platter and spoon over the roasted garlic-tahini drizzle and scatter with pomegranates arils.